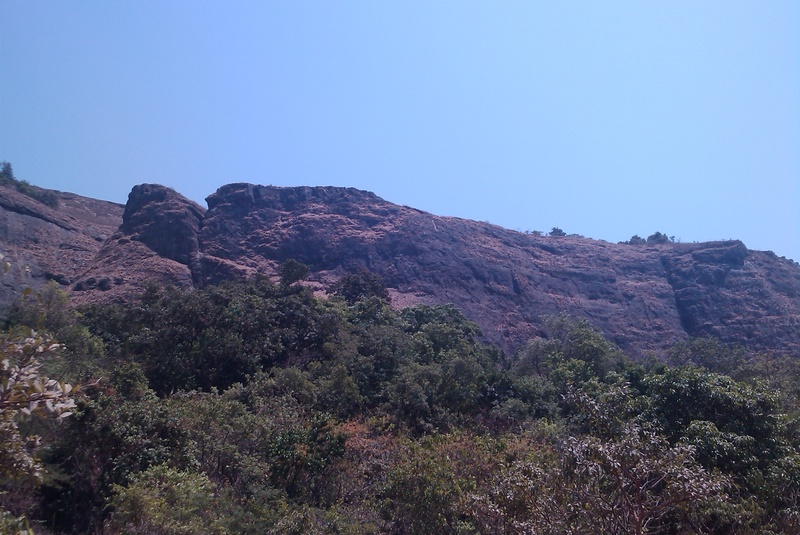 After a long tryst with destiny (Gumption traps) we decided to trek Rajmachi and came across this blog which said the walk to Rajmachi was enchanting. My legs are still aching and I cursed the person who wrote the blog, yet once done with the trek the experience was truly exhilarating. 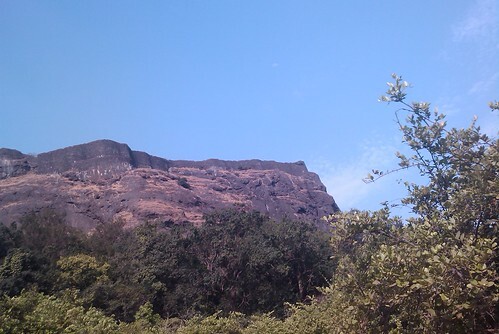 We reached Lonavala station at 2 pm (don’t ask why), but an avid trekker would have reached at the most by 10 am. The adventure started with the very fact that we reached at 2 pm, which meant the return journey would be after the sunset through the dark forest (No Street lights, obviously!). 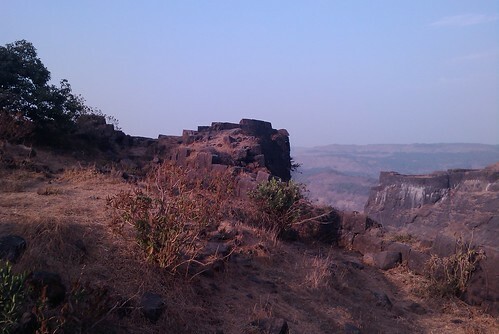 The fort is typically characterized by undulating hilly terrains, as most of the forts belonging to Shivaji Maharaj are. So Rajmachi hosts two forts or rather citadels (Bale Kille) know as Shrivardhan and Manoranjan, Shrivardhan being bigger of the two. 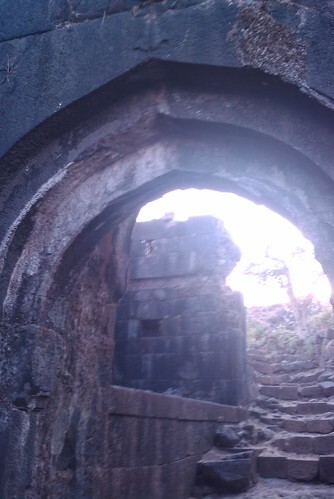 These two citadels were mainly used as watch towers to guard the Bhor ghat which connects Pune with Mumbai. Although Mumbai came to prominence only after the Suez canal was built, none the less this was an important trade route even during the reign of Shivaji Maharaj. I haven’t heard of any battles being fought at Rajmachi or any references on the internet, I guess this was indeed a safe haven. Well you can take two roads. 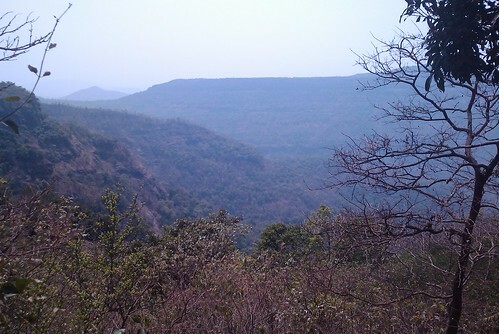 You can start from Lonavala and walk down to Rajmachi, which is approximately 20 km. The road is straight without much hiccup for a rookie trekker. Initially the forest was not dense, but as you proceed the forest gets denser. Also there was some construction activity going near the Fort (10 km from the Fort). I hope I won’t get to see street-side vendors around the Fort selling cheap stuff, just the way we have here at Shaniwar wada. Lazy bums can get their bikes right upto the foothill of the fort through the dusky road, but not in rainy season. I would rather prefer to walk out of respect for our historic heritage. 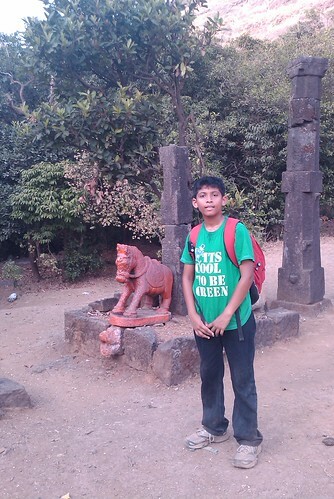 The other way is from Kondivade village near Karjat. Word of caution: Take lots of water with you (at least 2 ltr / person), because along the way you won’t find any drinking water, no locals, no other source or water. Well the good news is that there is a village on the foothill of the fort and yes you do get mineral water as well. The main attraction for me was the not the fort but the temples. Most of the Forts in Maharashtra are no more than a hip of ruin surrounded by fortified walls in ailing condition (I so very painful to make this statement, but that’s the truth). 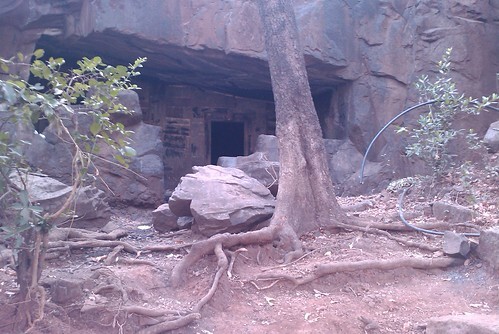 After a long time I saw a few glimpses of historic architecture in form of temples and the cave. Last time I remember getting a feel of this kind of architectural beauty was Sindhadurg fort. So near… Yet So far. 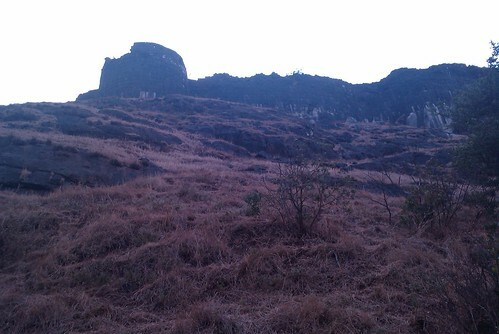 After a marathon run from Lonavala station, this 100 mtr climb seemed Herculean. Finally on the top of the world! On right hand side is Shrivardhan. Well having said that, the view from the top was worth three hours of huff-puff (to be read as breath taking) journey through the woods. It’s a sustainable world ? This blog is inspired by the clean tech Presentation on Clean tech by Anil Paranjape at startup Saturday. I was particularly interested with this video on clean tech. This particular video showed in animated manner how natural resources are exploited by corporate giants for the generation of consumer good. Although I feel the video is bit overkill, but here’s my take on the video. Well this brings to my mind some scenes from some of my favourite movies. Well who can forget the characteristic “Tumse dugna Lagaan Vasool karega!” dialogue, inspiring intense loathing for the British. Umm… really? Well what about the lovely British lady who sang songs of love running around the sparse bushes of Champaner for our adorable “Bhuuvaaan!!”…. “Yesss.. I am in love!” So, well the loathing is not for the British, but clearly their undue “Dugna Lagaan” policy. Well in technical terms it would be the imperialist policies of the British that Indians opposed of. During the 17th and 18th Century Europe experienced the great industrial revolution and England was the cradle of the revolution and subsequently the leader. Now England being a small country it couldn’t find all the resources it’s factories required and hence venturing out was the only logical alternative. With it’s new found technology and “By hook or by crook” policy the British Empire never saw sun going down for a long time. Not only India but all the British colonies were exploited of their natural and human resources. In this century the imperialism is left far behind, but the traces are still there. Well another very inspiring movie. I clearly recount the scene where Barrister M K Gandhi descends from the ship on India shores and take an extensive tour across the nation ascending to the role of Bapu. Along the tour he meets farmer aggrieved by forced cultivation of Indigo and battling the famines. Well after twenty years Bapu figures out that the natural resources of India are exploited for the factories of Manchester and Chelmsford. So he laid the foundation of non co-operation movement. Apart from the overall success or failures of his life, Gandhiji was very wise to clearly demarcate values from people. This demarcation at any point of time is very important for a value centric, process oriented action plan. This movie was a showed stark reality of the happenings of Liberia and their diamond mines. Here Leonardo di Caprio shown as a mercenary who trades weapons for diamonds. At one point of time explains how the whole business runs. So he trades weapons with the extremist for the diamonds, he then hands them over to local authorities who certify them to be excavated in South Africa by a Big South African company. They are then sent to India for polishing and then the company hordes the diamonds, to create artificial scarcity in the market. Then the advertisement campaigns are run to show how rare a diamond is. The worst part of all this blood diamond was school going children were abducted, brainwashed, exposed to drugs and prostitution at a very early age and made soldiers of the bloody revolution. The movie ends with the UN passing a resolution stating that the natural resources of a country are their own and others have no right to exploit them. Thus end the sad saga of conflict diamonds, well at least in the movie. Well the video also shows the same thing, portraying entrepreneurs as imperialist. As I said earlier that imperialism though non-existent in official senses the traces are still there. Well with India having 50% of the child labour the problem is very serious. 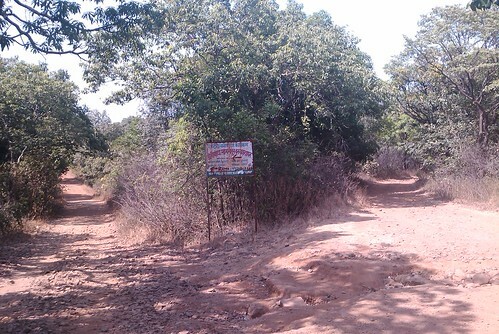 The saga of builders trying to grab land on Vetal Tekdi in Pune. Leather tanneries in Kanpur letting out their untreated waste into River Yamuna. The famous Taj corridor case. This blog is a followup of the previous blog in the startup Saturday series. 1. Commodore V. G. Praveen from Inland windsurfing and sailing academy. One common thing evident about all the speakers was the air of euphoria and the passion with which all the speakers spoke. Praveen has been into sailing and windsurfing for past seven years and started teaching five years back. How did he start his academy? Well started Sailing from a club in Pune, which organised a camp once in a year. Later on he moved to Goa to get a formal course in sailing, windsurfing. When he decided to start his academy he looked out for second-hand equipment and he found out quite a few sellers for that. There was a very peculiar associated with the purchase, all the equipment required repairs and the spare parts were not available in India. To add to the trouble the spare parts were not interchangeable and hence he had to go to Thailand to buy new equipments. Currently the equipment is exempted of customs. 1. The general prejudices in the minds of people, that adventure sports are dangerous. 2. All the equipment required for their water sports activity has to be imported; hence the overall cost for the course is expensive as well. For kayaking: A place where the water is calm and there is not much wind, like lakes. For windsurfing: The water body should be more than three kilometres in diameter otherwise it is not enjoyable. Also as the name implies there should be sufficient wind for windsurfing. How do they promote their academy? Through their website http://www.windsportsPune.com and word of mouth. They have taken no effort in doing the promotion for their company since there is a very niche segment of people who have interest in water sports and according to him it’s not possible to attract these people through advertisement campaigns. Since this sport is very niche there aren’t many people involved in this business. Adventure sports enthusiast should be looking forward to this as a wonderful opportunity, since in coming five years there would be a new generation who would want to get involved in adventure sports and they would be earning enough to pay handsomely for adventure sports. If a person follows basic instructions of the course, there is no risk involved in water sports. Till date there has been no mishap in his academy. Templepilot is the only registered school for paragliding in India. They started 14 years back. Anita quit her corporate job to help her husband formalise his hobby of paragliding into a well structured course with a good business vision. “..,.his (Avi) being in the top three in the NDA entrance, winning the prestigious Presidents Gold Medal and being chosen for the IAF as a Fighter Pilot came so naturally that it seemed as if he were destined. Well Anita testified that she is enjoying every bit of Templepilots and never once did she regret quitting her job. Looking at their success story and along with their decision to quit their jobs (most people reading would die to get that kind of jobs) for the sheer joy of flying, it is in the true spirit of “Keep the Aspidistra Flying”. Templepilots is experiencing competition created by them. Yet since the space is really wide more competition can still sustain without much adverse effect on the business. There are not lot many instructors willing to take up the job. It takes around two years for them to train a person for the job of instructor. All equipment required for the flying has to imported, also there are no tax exemptions for the imported goods. If you are physically fit to drive a cycle, you can fly. You should not have any back aliments. How did they promote their flying school? Anita is the one who does all the promotional activity for their venture. So when they start Templepilots. Anita randomly caught hold of groups in a cafe or any other public tweeting places and told them about flying and Templepilots. The good thing that happened for them wa s that their initial students were influential people of the society and hence the word of mouth publicity was very effective from the very early days. Their track record has been so far very clean with no mishaps. Is there any scope you running into a tree? Well if you aim for it, for sure you can! This was a witty reply to the above query by Anita. Moral of the story, paragliding is a very safe sport and the glider is in total control at any point of time, provided the glider adheres to the regulations and does not push things beyond the safety threshold. Japalouppe is a Horse riding club located in Talegaon Dabhade, an hour’s drive from Pune. It’s a mother and son venture. Started by his mother Lorraine Morey and later on assisted by her sons Rohan and Nikhil. Japaloppe is into training for horses riding, consultation, breeding and allied services for horses. Right now they are the biggest players in Pune and recently they have started another training school at Ranchi. Rohan was born and brought surrounded by horses. His father and grandfather are involved in the business of breeding horse. He is a third generation horseman. How did he start his business? So Rohan started his business by borrowing money from his father. At some point of time he did want to quit the business since at an early age (about 25 years) he was not able to manage the business. The only motivation at that point of time was his passion for his horse riding school. Slowly he managed to turned the tide and right now they are doing great business and profitable as well. Currently they are catering big corporates and schools in and around Pune. So Rohan talked about the different Market segments in his line of business. 1. Single horse owners: Not much of the competition since they own a single horse and their business operations are ad hoc in nature. 2. Riding schools to train riders for competition: So there are a lot of riding schools which exclusively train students for competitions, which is a very niche market segment. 3. Generic riding school: This is the segment Japalouppe operates in. This accounts for the largest pie of the horse riding schools, which has a formal structure to its training. Major portion of their business comes from the camps which they conduct for the students in the summers. Japalouppe not only conducts training for beginners, but also grooms up students for competition. They have resorts wherein they offer a complete joy ride for the trainees or weekend euphoria for enthusiasts.